Love him or hate him, there’s no denying Christopher Columbus was a significant figure in world history. His reputation may have taken a beating in recent years, but federal workers still get a paid day off work in his honor. Which makes this the perfect opportunity to revisit the famous explorer’s life and legacy. Take the quiz below and test your knowledge of the man who discovered the New World (except, of course, for the Vikings who beat him to it and the native peoples who were already here). 1. 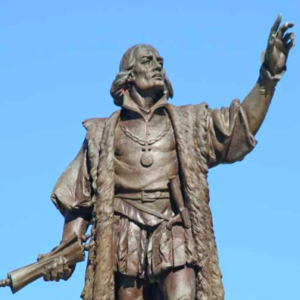 Where was Columbus born? 2. What was his occupation? 3. Where did Columbus intend to go on his famous voyage? 4. What was he hoping to find in the New World? 5. After he was turned down by three countries, who finally sponsored Columbus’ trip? 6. Which of these was NOT one of Columbus’ ships? 7. Where did Columbus make landfall? 8. In all, how many voyages did Columbus make to the New World? 9. When did Columbus Day become a federal holiday? 10. What state’s capital is named in the explorer’s honor?